How do I get a tax deduction for donating a vehicle? The IRS rules are very specific when it comes to receiving a tax deduction for your vehicle donation. Follow the exact, step-by-step instructions below to ensure you're eligible to get a deduction for your donation. In an effort to keep this article length to somewhat of a minimum, we reference several IRS Publications rather than include the actual text. You can find these publications on the IRS website by clicking here. You must take into account certain limitations on charitable contribution deductions. For example, your deduction cannot exceed 50% of your adjusted gross income. Other limitations may apply such as the types of organizations that are qualified to receive tax deductible contributions (see below). If you're eligible to deduct charitable contributions for federal income tax purposes and you want to claim a deduction for donating your car to charity, then you should make certain that the charity is a qualified organization. Otherwise, your donation will not be tax deductible. The most common types of qualified organizations are section 501(c)(3) organizations, such as charitable, educational, or religious organizations. 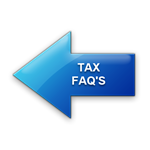 Click Here to verify that an organization is a charity qualified to receive tax-deductible contributions. You may also verify an organization’s status by calling the IRS Customer Account Services division for Tax Exempt and Government Entities at (877) 829-5500 (toll-free). Be sure to have the charity’s correct name. It's also helpful to know the charity’s address. Not all qualified organizations are listed at the site above. For example, churches, synagogues, temples, and mosques are not required to apply to the IRS for recognition of exemption in order to be qualified organizations and are frequently not listed. If you have questions, call Customer Account Services at the above number. The maximum amount you can deduct on your income tax return is the fair market value of your car. Fair market value is the price a willing buyer would pay and a willing seller would accept for the car, when neither party is compelled to buy or sell; and both parties have reasonable knowledge of the relevant facts. Some fundraisers have mistakenly claimed that donors can, in all cases, deduct the full value of their cars as found in a used car guide (such as “blue book” value). A used car guide may be a good starting point to value your car, but you should exercise caution. The IRS will only allow a deduction for the fair market value of the car, which may be substantially less than the “blue book” value. You donate your car to the local high school for use by students studying car repairs. Your credit union representative told you that the “blue book” value of the car is $1,600. However, your car needs extensive repairs, and after some checking, you find that you could only sell your car for $750. Your charitable contribution deduction may not exceed $750, the fair market value of the car. For information on determining the value of your car, see Publication 561: “Determining the Value of Donated Property”. If you used your car in a trade or business, see the rules for contributions of capital gain property in Publication 526. Depending on the amount you're claiming as a charitable contribution deduction, you may need to get and keep certain records and file an additional form to substantiate your charitable contributions. See the chart "Record-Keeping and Filing Requirements at the end of this page. 3. A statement that goods or services that the charity provided in return for the contribution consisted entirely of intangible religious benefits, if that was the case. You must get the written acknowledgment on or before the due date of your return, or the date you file (whichever is earlier). A charity can provide either a paper copy of the acknowledgment to the donor, or a charity can provide the acknowledgment electronically, such as via e-mail addressed to the donor. Do not attach the acknowledgment to your income tax return; instead, retain it with your records to substantiate your contribution. Depending on the amount of the deduction you claim for the car, you may have to file an additional form with the IRS with your Form 1040. If the deduction you're claiming for a donated car is greater than $500, you must complete Section A of Form 8283. If the deduction you're claiming is greater than $5,000, you must get a written appraisal of your car (see Written Appraisal below). You must also complete Section B of Form 8283, which must include the signature of an authorized official of the charity, and attach it to your return. Your written appraisal must be from a qualified appraiser. See Publication 561: “Determining the Value of Donated Property”. The appraisal must be made no more than 60 days before you contribute the car. You must receive the appraisal before the due date (including extensions) of the return on which you first claim a deduction for the car. For a deduction first claimed on an amended return, the appraisal must be received before the date the amended return is filed. When you file your income tax return (Form 1040 or Form 1040X), you'll need to complete Section B of Form 8283, and attach it to your return. If Section B is required and the charity sells or otherwise disposes of a car within two years after the date of receipt, the charity must file Form 8282: “Donee Information Return”, with the IRS. On Form 8282, the charity reports information identifying the donor and itself, and the amount it received upon sale or other disposition of the car. The charity must provide you with a copy of the form. 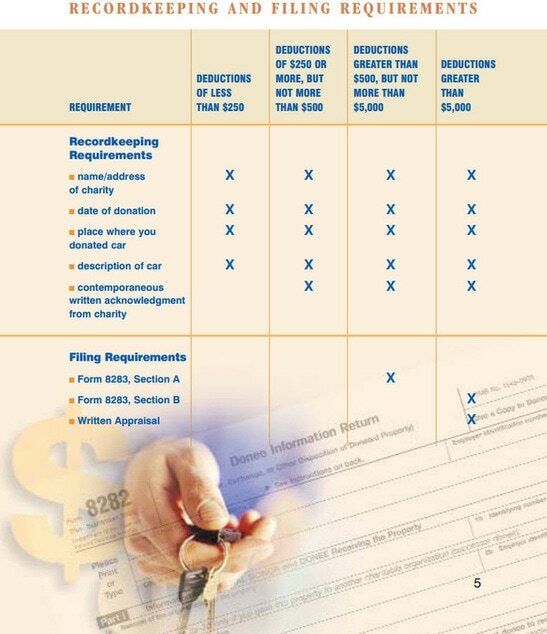 The chart below provides items of recordkeeping and filing requirements, based on the amount you claim as a deduction. Let us know if you have any questions!